STRUMIS LTD is delighted to announce that it has formally signed a dealership agreement with SigmaTEK Systems, LLC of Cincinnati, OH, USA. SigmaTEK Systems LLC is the internationally renowned developer of SigmaNEST, one of the most respected plate nesting software programs in the world. Since its formation, the company has experienced continual growth with more than 7000 SigmaNEST installations worldwide. STRUMIS LTD is the leading supplier of software solutions to the international structural steel industry since 1986. With core business areas in the Building and Construction, and Process and Power industries, STRUMIS LTD products have consistently transformed its customers’ business in the steelwork fabrication supply chain. 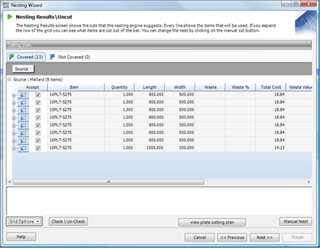 As part of the recent dealership agreement SigmaNEST has been embedded into StruM.I.S .NET V7.4 to provide plate nesting which will complement STRUMIS LTD’s existing linear nesting, and in exactly the same way as linear nesting will allocate/nest plate mark items from inventory (shaped, square or rectangular) or supplier available sheets. The required sheets will then be added to the purchase order automatically and any remnants/off cuts returned to inventory. A DXF export file will be forwarded to the relevant plate profiling machinery within the STRUMIS .NET Production Control module to complete the process. This significant new functionality will deliver substantial benefits to users of STRUMIS .NET in terms of both maximizing materials and minimizing wastage, together with integrated production processing through CAM/CNC technology. SigmaTEK Systems, LLC, is headquartered in Cincinnati, Ohio, near the heart of the U.S. manufacturing belt. Founded in 1992, SigmaTEK provides software solutions to enhance efficiency and profitability for sheet metal, wood, and composite fabricators through its CAD/CAM nesting platform - SigmaNEST. SigmaTEK has sales and support offices branches throughout the U.S., UK, Europe, China, Japan, India, Australia and South America, with resellers in South America, Eastern Europe, and Russia. SigmaTEK Systems, LLC was founded by a group of manufacturing and engineering CAD/CAM experts with decades of experience in the fields of production optimization and automation. The first SigmaNEST software package was installed in 1992. Since its formation, the company has experienced continual growth with more than 7000 SigmaNEST installations worldwide. STRUMIS LTD is a leading supplier of software solutions to the international structural steel industry since 1986. With core business areas in the Building and Construction, and Process and Power industries, STRUMIS LTD products have consistently transformed its customers’ business in the steelwork fabrication supply chain. STRUMIS LTD also has a dedicated hardware business that provides its customers with the very best price performance available on the market today. STRUMIS LTD over 2000 customers in over 80 countries across five continents, with international operations supporting a global network of sales, support and services.